The Mad Maggies’ debut album. Recorded by Wally Sound, Oakland, California. Analog, 2 inch tape, 16 track. Mastered by J. J Golden, Ventura, California. Cover design and layout by Media Rare. Sleepy Maggie – rousing urban take on a trad Celtic reel. USed in the TV pilot of the Black Donnelly’s on NBC. Time’s Up – where does the time go? 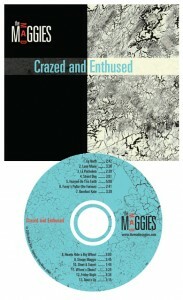 AS HEARD ON TV: “Sleepy Maggie” from “Crazed and Enthused” is used in “The Black Donnellys” pilot. About 7 minutes into the show there’s a bar scene –“Sleepy Maggie” plays throughout the scene. This series is created by Paul Haggis (Million Dollar Baby, Crash, Casino Royale) and written by Robert Moresco (Million Dollar Baby, Crash). The tune is a Mad Maggiefied version of a traditional reel. “Luna Marie” & “Street Dog” from “Crazed and Enthused” were nominated by the Just Plain Folks Music Awards 2006 in the cabaret and cajun song categories respectively.